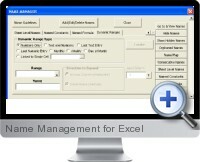 The Name Management Add-in for Excel allows to easily and quickly create and manage all Excel named ranges and constants. The Name Management Add-in features automated tools to delete all redundant or broken names, create named constants, dynamic named ranges (ideal for charts and Pivot tables), Worksheet level names, consecutive named ranges and more. There are many benefits of using named ranges as opposed to range addresses when working and building analytical models in Excel. For example =SUM(Year_2007_Figures) is much better than =SUM($B$2:$B$200). The use of named ranges also means you can get to the named ranges very quickly and easily. All features are extremely easy to use and help is provided within the code behind the Excel Add-in to guide through any steps.